The weather is warming up and its finally time to wear jean jackets and shorts! Only way to wear a jean jacket is with a ton of patches..right? We carry poison apple patches and metadope patches and pins to help keep your jackets/vest beautiful. 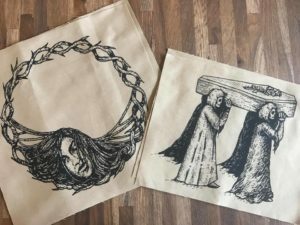 Poison apple is run by artist Adrienne Rozzi, Poison Apple Printshop is a one-person operation creating otherworldly artwork and accoutrements for all manner of strange folk. Rozzi’s interest in historical witchcraft and magick reflects in the immersive, old-world nostalgia of her original illustrations which draw you into an enchanting realm of arcane knowledge and dark wonderment. As informative as they are bewitching, these drawings adorn the Printshop’s creations, imbuing them with unique meaning and a magical sacredness. Metadope a is a Baltimore-born independent brand. Metadope makes products that they’re into, in hopes of attracting like-minded folks; it’s as simple as that. They collaborate with many artists across many different fields to bring you products worth owning. There’s something about patches that remind me of tattoos… its self expression with just artwork on your clothes. There’s so many different styles of patches we carry i would like to think one for every kind of person!